The NHS has been preparing itself for a bad flu season after the strain that ripped its way through Austrailia in 2017 has been reported in UK with increasing cases throughout. 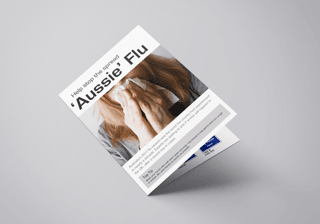 We’ve put together some useful tips and a range of products to help stop the spread of ‘Aussie Flu’. Read our top tips and view recommended safety signage. Order your signage direct from our dedicated signs website today: www.safetynetsigns.co.uk or get in touch to speak to one of our sales advisors.